Students participating in the first annual Entrepreneurship Skills and Knowledge Accelerator. The Carson College of Business is running its second annual WSU Entrepreneurship Skills and Knowledge Accelerator (WESKA) 8 a.m.–5:45 p.m. June 10–14, in Spark 339. 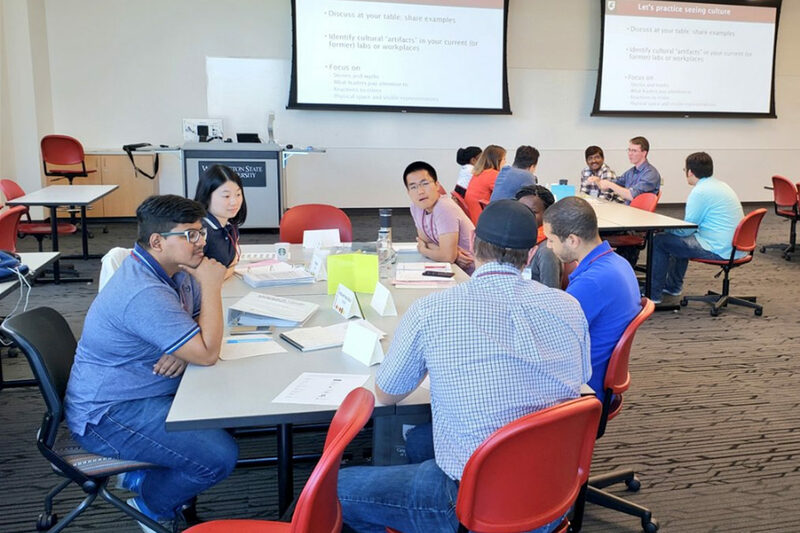 WESKA is an immersive, weeklong accelerator boot camp open to WSU postdoctoral, doctoral and master’s students from any discipline or WSU location who want to learn more about entrepreneurship. Participants may register until 5 p.m., Friday, May 17. Applications after this date may be considered if space is available. Interested participants are strongly encouraged to consult their faculty advisor/supervisor before applying for WESKA. WEKSA is not a sit back and listen course. It is an exciting, dig deep, learning experience. Activities include analyses, real‑time work with ideas, role‑plays, videos, group discussions, expert panels, anecdotes, lively social events, practice in financial and market assessment and other tools. The WESKA curriculum has been designed by Carson College faculty, led by associate professor Arvin Sahaym. Sessions will be led by top WSU faculty in strategic entrepreneurship, finance, management and marketing, with guest presentations by campus, community and alumni start‑up experts. WESKA is not offered for academic credit. The Carson College is offering WESKA at no cost to the WSU graduate and post‑doctoral community, with the generous support of Carson College donors. Breakfast, lunch and dinner are provided daily. Housing assistance is available to interested students coming from campuses beyond Pullman.